Milagra Ridge is a small, mile-long ridgeline in San Mateo County, an isolated unit of the Golden Gate National Recreation area, near the Pacific Coast south of San Francisco. I was at the San Mateo Convention Center for a volleyball tournament and with a free hour and a half drove out to check out the area and tag the highpoint. The TH has no formal parking aside from the dirt shoulders of the road, maybe enough for 8-10 cars. In usual NPS fashion, the signs and information boards are immaculate, the trail carefully lined with posts and a low guard wire to keep people off the flora. The weather was heavily overcast as a small storm system was approaching the coast. Light mist had wetted most everything and hampered views, but it was nice for hiking in. 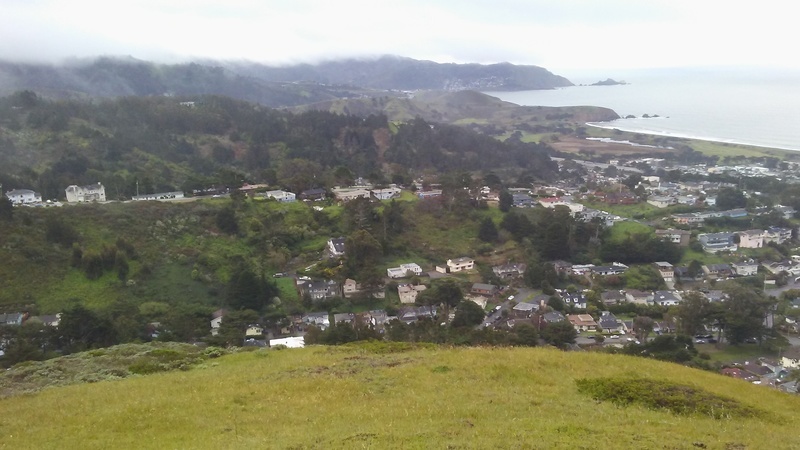 The summit is found just above the TH, overlooking a buried reservoir on one side, the Pacific Ocean and the neighborhood of Sharp Park to the west. The clouds obscured views from the highpoint, but lower points along the trail I hiked provided the missing views. Flowers were beginning to make their appearance but were mostly closed with the chilly weather. I only had time for maybe a 20min visit before having to return, an exceedingly short visit.